The annual award recognizes exceptional academic-industry partnerships in three categories. Robots are playing a growing role in operating the heavy equipment that is used in every field of industry and exploration, including space exploration. So finding ways to visualize and train them is becoming increasingly important. 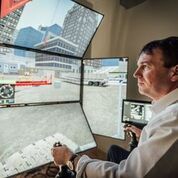 Professor Jozsef Kövecses, of the Department of Mechanical Engineering and the Centre for Intelligent Machines, has developed, together with Montreal-based software company CM Labs Simulations, enhanced virtual prototyping and training simulators for various types of heavy equipment including space and ground-based robotics. Today, the Natural Sciences and Engineering Research Council of Canada (NSERC) recognized their collaboration with the Synergy Award for Innovation (small and medium sized companies). Kövecses’ research group develops mathematical models that generate lifelike computer simulations of mechanical systems. By simulating versions of new robots, vehicles, farm equipment, and other heavy machinery, CM Labs Simulations helps their clients experience how physical objects will perform under various circumstances. Testing mechanical systems in a simulated environment, clients are able to identify problems with the proposed models before producing a final design. Engineering firms and training schools for heavy machinery and vehicles are increasingly using these simulations as a way to lower costs, eliminate risks and lessen the environmental impacts of the industry. Julie Payette, Governor General of Canada, will present the prestigious award to Professor Kövecses and Dr. Arnold Free, CCO of CM Labs Simulations, at an award ceremony at Rideau Hall this evening. Kirsty Duncan, Minister of Science, and Mario Pinto, President of NSERC, will also celebrate the awardees at the ceremony. Launched in 1995, the NSERC Synergy Awards for Innovation recognize partnerships in natural sciences and engineering research and development (R&D) between universities and Canadian industry. Kövecses’ is the first award in this category for McGill since 2012. As an awardee, he will receive a $200,000 NSERC research grant. CM Labs Simulations will receive a $30,000 voucher, valid towards the cash portion of their required contribution in a new Collaborative Research and Development Grant (CRD).